Welcome to Crackmaster Windshield Repair!! In most cases, your windshield is STILL REPAIRABLE even if the damage is bigger than a quarter or has grown into a long crack up to 24 inches! A PROFESSIONAL Windshield repair is a SAFER alternative to replacing your windshield. Crackmaster Windshield Repair is the ONLY windshield repair company that CAN repair what other shops CAN’T and WON’T tell you is possible. Then guarantee it forever!! The first and most important reason to repair your windshield is to restore it to a SAFE condition. Your windshield is the largest safety device of your vehicle and your repair MUST be done properly to be considered a SAFE restoration to the glass. The next reason is the most popular, and that is to keep the damage from growing. 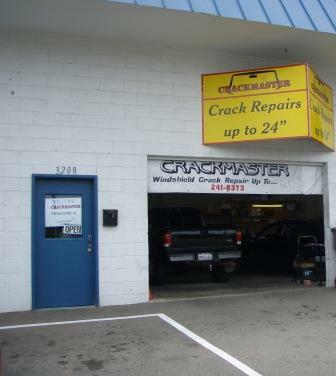 Crackmaster guarantees that the repair will NOT continue to grow OR YOUR MONEY BACK! The following link will provide you with the most ACCURATE information regarding your windshield needs. If you have any questions please feel free to call me. DON’T REPLACE your windshield until you explore all of your options. Call for Driving Directions to our Location!